Merchandise is a fun way not only to make some cash for your band, but also further express your band's branding outside of songwriting and album art. With touring, writing, and performing, however, merch usually takes a backseat to some of the more pressing tasks. Therefore, a band's merch table usually ends up looking pretty standard: a few T-shirts, a bumper sticker, maybe a keychain if you're feeling fancy. One thing's for sure: whenever you're generating your marketing, release, or tour plan, your merchandise should be an integral part of your overall strategy. Think about it like a big brand's commercial campaign. Let's take fast food chain Wendy's for example. It'll run a commercial promoting its brand new Asiago Ranch Club sandwich, but it'll also have a standard commercial promoting Wendy's as a brand; not necessarily plugging a new sandwich, but just promoting the values Wendy's has and why you should enjoy the food. You should be like Wendy's, guys. Have material that's evergreen and can be sold year round, but also have your Asiago Ranch Club: that unique product that's hot at the moment and needs to be pushed. This can be something as simple as a T-shirt with imagery reflecting your new single, or something as intricate as a branded doormat to piggyback on your song about leaving your ex. That's the key, folks: sell merch that's unique to your work. This is going to vary greatly depending on your album, track, or brand as an artist. There still are, however, some standard ideas that hopefully can get your creative gears turning. Try these three on for size. I've seen plenty of signed merch do very well, especially signed drumheads and older posters. This is a genius move, as a busted drumhead is really just garbage, but when inked with your band's signatures, you can turn that trash into treasure. It's always great to sell limited edition versions of your albums – it's even great for restructuring previous albums, too. Take your work and get a limited quantity made in cassette and/or vinyl. Not only will vinylphiles love it, but it also brings back nostalgia for folks of the appropriate age. Also, more and more artists are creating tapes, and featuring a cassette as part of your merch is a fun and retro throwback for fans. I recently did a promo campaign for a project called Bear Hunt, which led to the group manufacturing hundreds of "giant scary bear" stuffed animals. It was based off a figure from the album cover, and it did very well! They ended up selling hundreds of bears all at live shows. Was it odd to see adults carrying teddy bears at a live show? Yes. Was it ridiculously profitable? Yes. 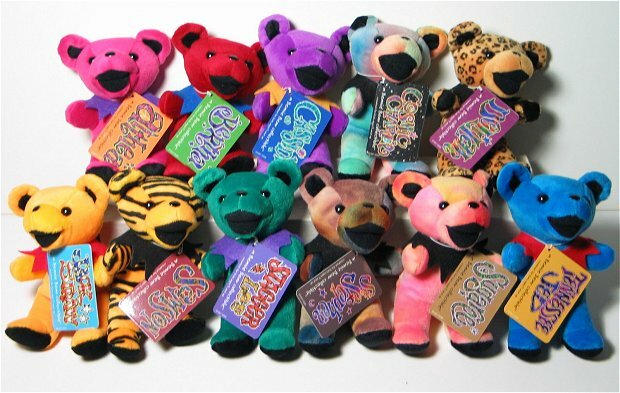 Bands have also made stuffed toys based on band members, which is also a cool and unique idea for merchandise. Probably not the best idea for the kid's rock band, but a great one for reggae or jam bands because, let's be honest, this would fit well into that demographic. There are plenty of companies that make both of these products for bands, and it's a unique way to stand out at shows. This can be one of those "evergreen" merch suggestions if it fits your vibe and sound. As alluded to in my brilliantly clever Wendy's reference above, try to get merch that's based on your song/album. This is a great and simple push that furthers the importance of a song in a way that fans can interact with. Have a song about a breakup? Branded tissue box. Have a song about dreams? How about a pillow case with your band's logo and lyrics? I've even seen artists push "hangover kits" at merch tables, since they were known for being party bands. Think about what works for you and what's unique to push to your fans!